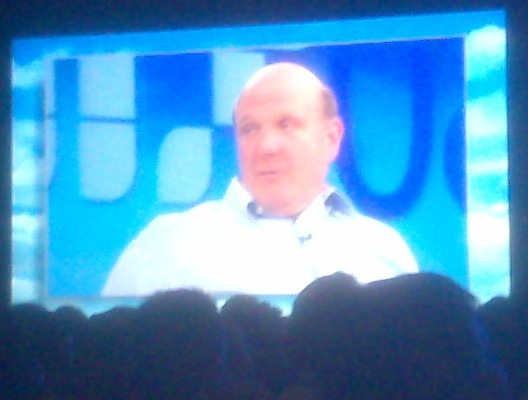 If yesterday’s Mix keynote was all about products and developers, today’s was all about Ballmer himself, who was interviewed on stage by Guy Kawasaki. Kawasaki, an ex-apple evangalist, pulled no punches – poking Ballmer on Vista, Google, Yahoo and Apple, as well as some pretty suprising jokes about chair throwing, anti-trust hearings and Ballmer’s infamous monkey boy dance. All of these were met with surprising good grace (although his less calm side never seemed too far from the surface). At one point, Ballmer even performed a brief minor variation of his dance on the request of one of the audience members, changing it to ‘I love web developers’. And, at one point we saw Ballmer goofing around and pretending he couldn’t carry Kawasaki’s MacBook Air because it was too heavy, and offering to get him ‘a proper machine’. The strategy position in general was pretty clear. On the subject of Yahoo, the reason for the purchase it that Microsoft sees search as the killer app of online advertising, and it sees (as we heard yesterday) online advertising as its key monetisation strategy. The greatest ‘synergy’ is pure scale. Does winning mean beating Google? Is it a zero sum game? Yes. However, whilst Google was the enemy in Microsoft’s online ambitions, Ballmer made it clear that there were other competitors in the other major markets they operate in: desktop, server and enterprise, entertainment and devices. The competitors ranging from IBM to Linux. One of the overriding messages of Mix08 however, has been that the other fights aren’t necessarily zero sum games, with Microsoft showing a genuine drive to interoperability in many spaces. Are they serious about this? Well AOL and DoubleClick were on stage at the key note, showing how their technologies fit with various Microsoft platforms. It all seems pretty genuine and various people have commented in a palpable change in the way Microsoft is now dealing with the outside world. Interesting to hear Ballmer describe Microsoft’s Search offering as the ‘little engine that could’, and to point out that the giant was very much the underdog both here and in the personal devices market. What about Facebook? He made it pretty clear the 2% stake in Facebook was a relatively small deal for Microsoft and that he cared more about their advertising ‘partnership’ with the social network than their stake in it; validating the view that the shareholding is a purely defensive manoeuvre. The question and answer session came to a close with a very bizarre and slightly uncomfortable question from an employee at Avenue A Razorfish, part of aQuantive which Microsoft bought last year to get their hands on Atlas. As a lot of people have noted, Microsoft is in a difficult position with Avenue A because of their relationship with other agencies. It’s been assumed it will be run independently or sold off. But the question from one of its staff in such a public forum: ‘What are your plans for us, we hear a lot of rumours’, must still have come as a bit of a surprise. Ballmer seemed unphased, and said the business would be left to run independently so long as it remained profitable but I wonder if any chairs went flying after he exited the stage.